Some of my readers had asked about a good anti-ageing cream for oily, combination skin. Most of the anti-ageing creams available in the markets are thick, heavy and meant for mature, dry skin. However, its good to start an anti-ageing regime in your twenties itself. The sooner, the better. But in your twenties, you might be kinda hesitant to try out anti-ageing creams which contains powerful chemicals like retinol, resveratrol, ceramides, collagen boosters, etc. And there is no need to start with such powerful ingredients in your twenties. So a good alternative is using a natural anti-ageing cream, preferably an ayurvedic one. Yes, ayurveda has remedies for anti-ageing too. Also, in your twenties, your skin will be more on the oily-combination side. So its better to look for a gel-based anti-ageing cream (which is rare to find). The search ends here! 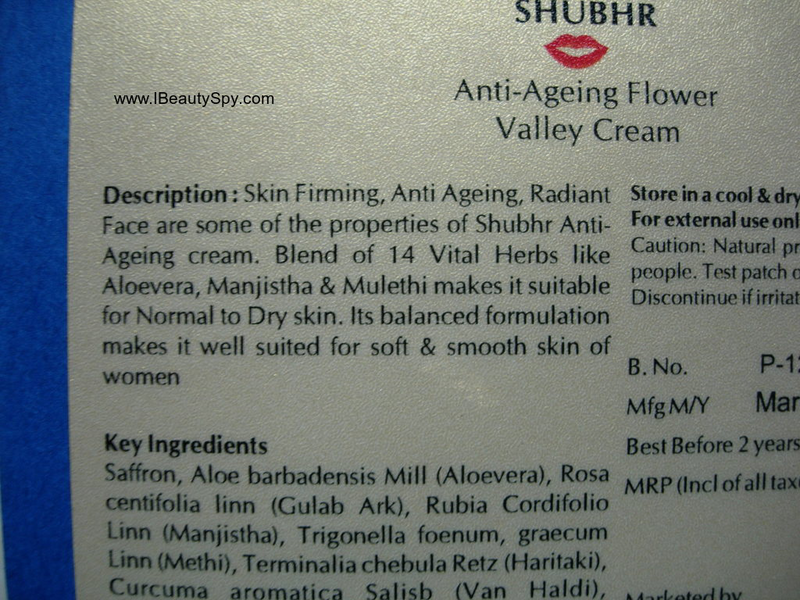 Yes, today, I will be reviewing the Blue Nectar Shubhr Anti Ageing Flower Valley Cream. Let’s see how it fares. 100% Ayurvedic Anti Ageing and Skin Firming Cream provides nutrient to skin to delay signs of ageing. 14 Vital Ayurvedic Herbs like Saffron, Aloevera, Sandalwood are blended together to create a potent yet natural anti ageing face cream. Available in hedonistic Flower valley aroma which is reminescence of combination aroma of of Rose and other wild flowers. Go ahead, look young and smell enticing with our straight from heart Ayurvedic anti ageing cream! Saffron, aloe vera, mulethi, rose, manjistha, fenugreek, haritaki, turmeric, sandalwood, almond oil, plum oil, wheat germ oil, deodar. The packaging of Blue Nectar Shubhr Anti Ageing Flower Valley Cream is to die for 😍! Just look at the luxurious golden, square tub with a transparent base that gives a glass-like look and you will want to buy this cream just for that! The golden lid closes with a satisfying click, so its travel friendly as well. The tub looks so pretty sitting on my dressing shelf and adds a luxury touch to my shelf 😀 . 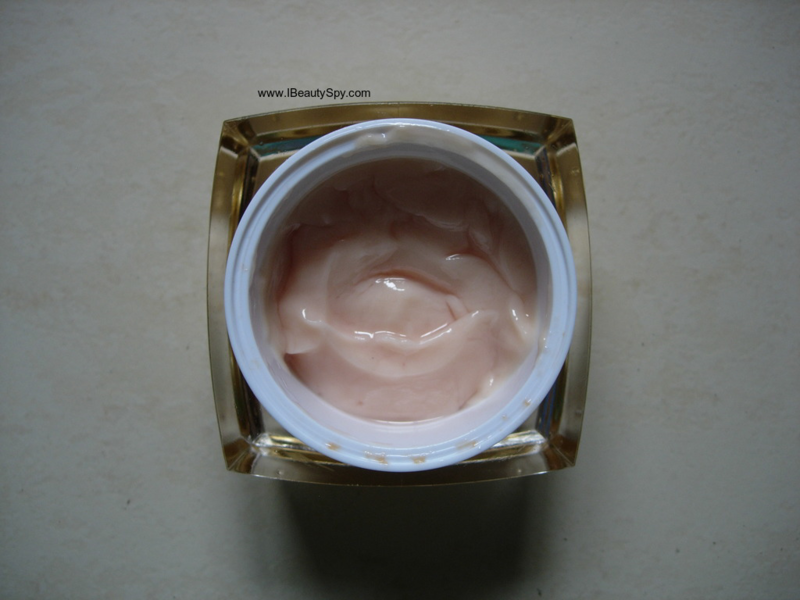 Blue Nectar Shubhr Anti Ageing Flower Valley Cream has a slight pinkish tint and the consistency is like a gel-cream. I love creams which are pink in color as somehow I get a feeling I might get baby pink skin on using it 😅. It has an ayurvedic herbal smell which is mild and not overpowering. 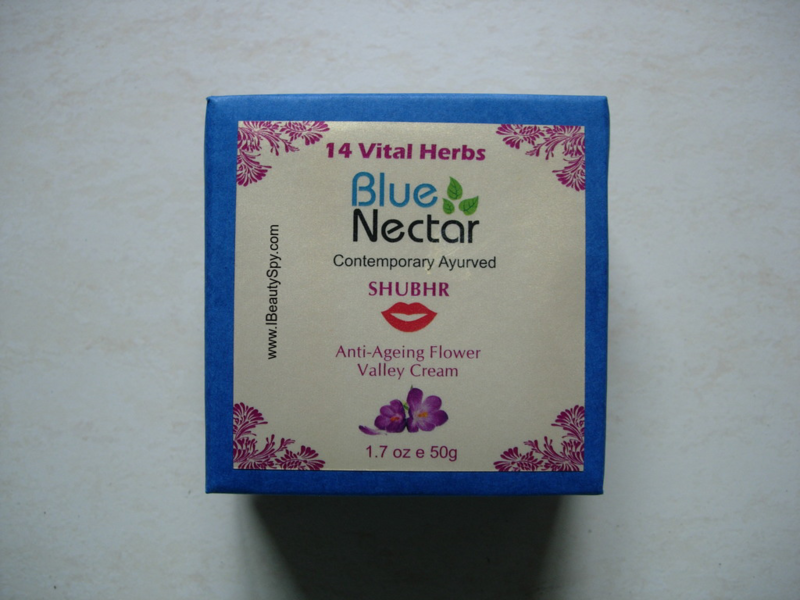 Blue Nectar Shubhr Anti Ageing Flower Valley Cream is light and fluffy in texture and gets absorbed in a jiffy. It doesn’t make face oily or greasy. Due to the presence of aloe vera, it is water-based and not oil-based. So its a great option for oily and combination skin people. Since I have dry skin, I feel it doesn’t moisturize my skin adequately. 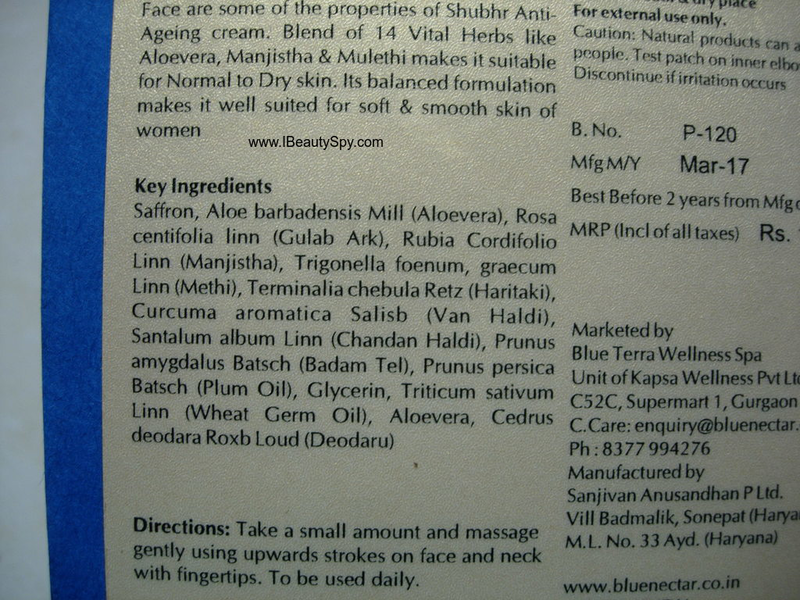 So before applying this, I use the Blue Nectar Shubhr Facial Oil which I have reviewed earlier. With continuous use for about 3 weeks, I can feel my skin is firmer, radiant and youthful. So the anti-ageing claims are indeed true. However, I haven’t noticed any effect on fine lines on my forehead. I feel that the cream has to be more moisturizing and nourishing for reducing fine lines and wrinkles. So I would say Blue Nectar Shubhr Anti Ageing Flower Valley Cream is a great option for those in twenties with oily, combination skin who are looking for a good, lightweight, anti-ageing cream. Since its natural and ayurvedic, you can use it safely. However if your skin is more mature with fine lines and wrinkles, it might not work for you. Mommy Makeover Tri-Cities is just the just the thing you need to boost your self-confidence and take back control of your appearance. The price is little higher, but you can get it in Amazon or Flipkart at a good discount. Check below for the links. Also you need only a small quantity each time, so one tub will last long. Also, they have two variants for the cream – one for women and one for men – which I think is great. Yes. It does make skin firmer and protects initial ageing signs. Fights dull skin and makes skin radiant and youthful. But I haven’t noticed any effect on fine lines or wrinkles as claimed. * Light gel-cream texture which gets absorbed easily. * Doesn’t make skin oily or greasy. * Makes skin firmer, radiant and youthful. * Fights and protects skin from initial signs of ageing. * Contains 14 ayurvedic herbs including plum oil. * Comes in two variants – for men and women. Yes, for oily and combination skin. No, since I have dry skin. But I would like to try other variants of cream from Blue Nectar. Price is little higher. But if you are looking for a natural, ayurvedic solution to ageing, there aren’t many brands catering to it. So I would say its worth it. 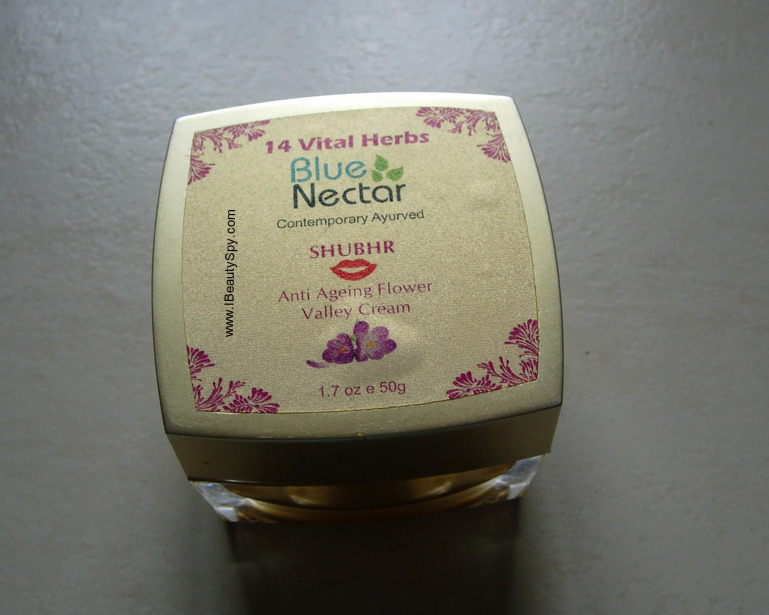 Overall, I would say Blue Nectar Shubhr Anti Ageing Flower Valley Cream is a good option for those who are starting out on an anti-ageing skin care routine. It prevents and protects the skin from signs of ageing. There aren’t many anti-ageing creams in the market that cater to oily, combination skin and also fully natural and ayurvedic. So I would recommend this to those with oily, combination skin. So that’s all folks! Hope this review was helpful to you. Also don’t forget to check out my review of Blue Nectar Shubhr Facial Oil which is one of the most affordable facial oils you can find in the market. You can check reviews of all Blue Nectar products here. * Review of Iraya Saffron Elixir | Comparison with Iraya Kumkumadi Oil and Kumkumadi Balm | Which one should you go for? Thanks for the review.. Since I have oily skin, I would love to try it!!! The cream is luxurious no doubt due to the ingredients. Saffron as the first ingredient is always a treat to the skin! Never tried anything from this brand, definitely going to try this once I am done with the Kama ayurveda brightening cream..
Do try it. Agree that there are not many creams with saffron as the first ingredient. Btw, how is the Kama Ayurveda one? Packaging is really luxe! 😍 Mum would like to try for her combination skin! Yes, packaging is simply amazing! I have got men’s cream but I wanted to use for women is this fine will there be any side effects please reply I had to order via amazon and this is not returnable also. Hi, Please use women’s cream only if you are a woman. Using men’s cream is not advisable.